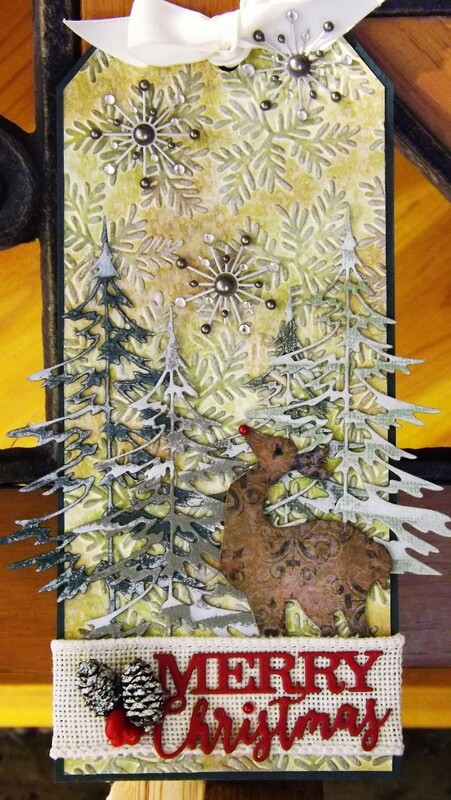 Linda’s tag uses these outstanding Trees from Tim Holtz called “Woodland Trees”, Thinlits Die 660978. After seeing them and how she used them, they became a must have item. My background was the basic Tim BG. Only difference is I used an Sizzix embossing folder after I applied my inks and missed it w/ water. Inked the raised images. 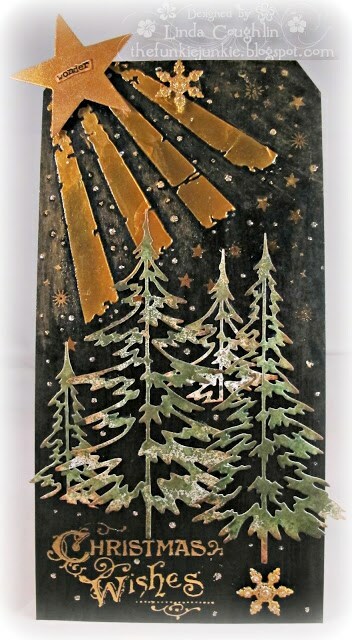 Trees were cut from four different cardstocks all at different lengths, stamped w/ Colorbox White ink and embossed w/ Ranger’s Frosted Crystal embossing powder. Enchanted Forest Holiday Ribbon (From Dollar Store). It's terrific!! It's the perfect Fall scenery. 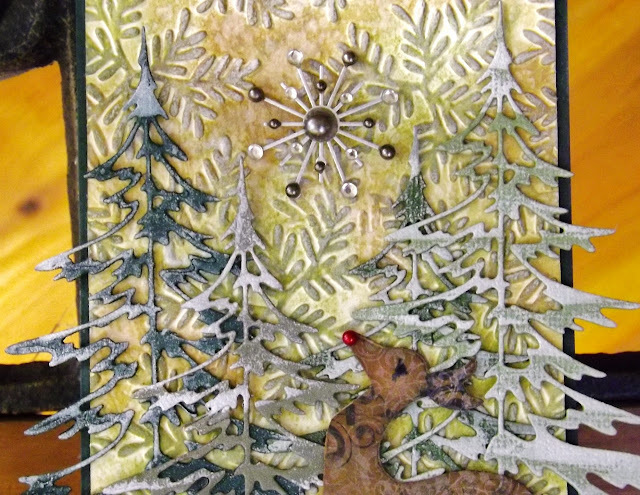 Love the addition of the deer and your sentiment looks wonderful. So enjoyed the picture you shared! Wow, love your trees, just love the way you have placed them on the tag, and your added tactile embellishment creates another interest to the eye, altogether a beautiful looking Tag. 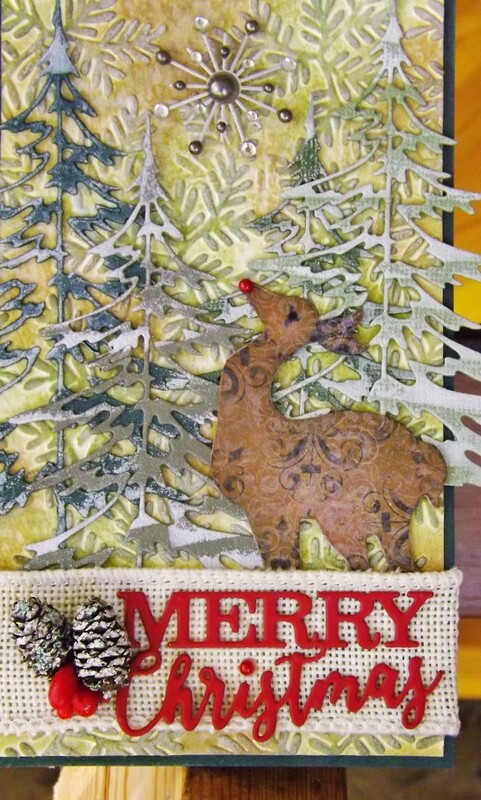 Oh I do love those trees too, how did I miss them ;) Love how you used them with the deer too! Love your picture, water and fall colored trees, wonderful combination! Absolutely gorgeous! So much fun seeing everyone's take on this one. I love your bright textured version! Your trees are wonderful and the golden glow you have captured for the background is just perfect. Love the textures of the background too. Another lovely piece of work. Your photograph is fantastic. I would love to be standing there enjoying that gorgeous fall day. 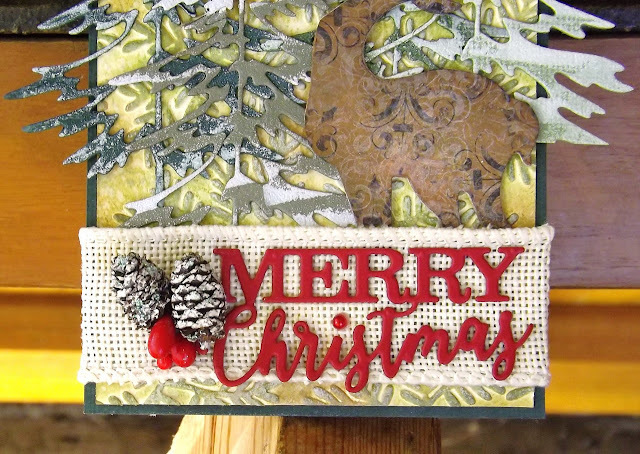 Thanks so much for sharing with us this week at the 12 Tags of Christmas Funkie Junkie Style! And again your Christmas tag is amazing! Love the way you scattered your pine trees (that is a die I do not have). The background is so lovely, Vada! Big hugs!